While I wanted to enjoy Secure Daughters, Confident Sons by Glen T. Stanton, I struggled to finish the book (that may be an understatement since I think it has been sitting on my nightstand for almost two years). Stanton does hit on important issues that are relevant in the American culture of today. He is quick to point out that while males and females are different that does not make one gender superior. The first portion of the book set's out a "Clear Vision for Authentic manhood and Womanhood", while the last half covers "Why Boys and Girls Need Mothers and Fathers" I found myself agreeing with much of what Stanton had to say, I just couldn't get into the book. I do think this book would be a great starter for a parent who is just being introduced to a traditional, biblical view of gender differences, and for a parent of older elementary age children. The most beneficial part of the book for me, was the Q & A section at then end of each chapter. His response to common questions that parents face provided a great means to move toward personal application. 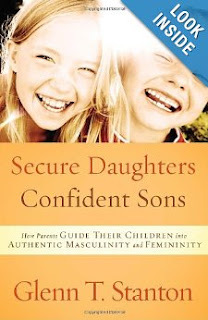 While Secure Daughters, Confident Sons by Glenn T. Stanton wasn't the best book I've read this year, it was certainly a solid offering. Perhaps as my children grow out of toddlerhood and the preschool years, I might want to read it again. Also, it'd be super helpful if you reviewed my review here, so I can keep getting great books from a great publisher!